The first concert in the high school was just one year after the final concert in the theatre. It was fitting that local organist, Larry Ferrari, played that concert. Over 1200 attended that premier concert. Since 1970, over 275 concerts have been presented along with a wide variety of other programs – from playing audience walk-in/walk-out stints to accompanying silent film shows, choruses and even the Nutcracker Ballet. 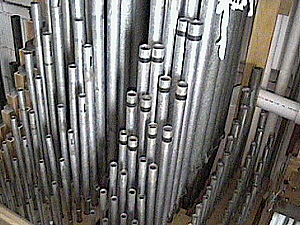 Some of the fabulous Kimball strings. Read an article about DTOS and the Kimball organ in the March, 2013 issue of Delaware Today magazine. Click here to read the article. Click here to read what columnist Gregory Coin wrote about DTOS in an online magazine called Examiner.com on June 6, 2010. For a schedule of arts and culture events in Delaware, please go to www.inWilmingtonDE.com . Jelani Eddington — March 8, 2008. To read about the artist click here. To read Mark Dresden’s review of Jelani’s concert appearance, click here. Richard Hills — November 17, 2007. To hear a sound track from his CD, go to our Organ Tour page. To read Mark Dresden’s review of Richard’s concert appearance, click here. Trio con Brio — September 29, 2007. To read about the three artists click here. To read Mark Dresden’s review of Trio con Brio’s concert appearance, click here. Chris Elliott — June 9, 2007. To read Mark Dresden’s review of Chris’ concert appearance, click here. Chris Elliott was our artist on Saturday, June 9, 2007. According to Stephen Ross, who oversees the DTOS Music Shop, “Movie accompaniment is really his forte. 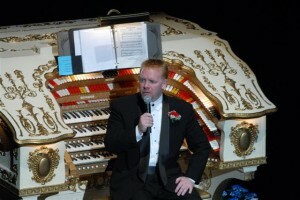 Chris studied with the legendary Gaylord Carter, and he is today one of the finest silent film organists on the circuit in addition to being a fine musician all around.” Chris played a concert program in the first half and accompanied “IT”, Clara Bow’s classic film, in the second half. 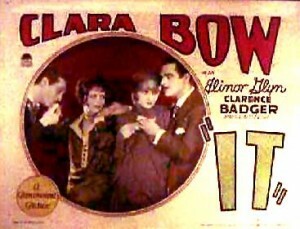 Find out more about Clara Bow and the classic film “IT” at http://www.clarabow.net. Simon Gledhill appeared in concert on April 28, 2007. To read Mark Dresden’s review of Simon’s concert appearance, click here.